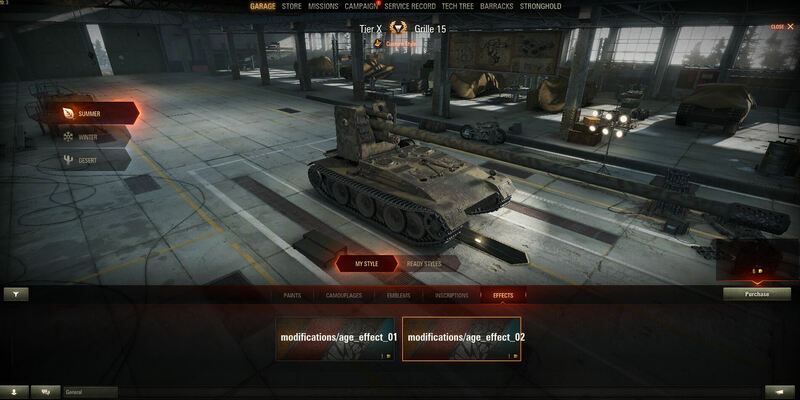 Customization is the key to turning your vehicles into fully realized digital representations of you and your personality, achievements, and favorite parts of World of Tanks. That’s the vision, and now we’re laying down the foundation for it, marking the first step towards new ways to experience World of Tanks. It introduces visual effects and a significantly wider list of paints, camo, emblems, and inscriptions to pick from. Most importantly, we’re redesigning the way customization works, adding styles and mapping out a set of customizable areas on a tank. The “Exterior” window gets five separate tabs, where you can apply predesigned style sets or create your own using paint, camouflage, emblems, inscriptions, and visual effects. Here we'll talk about all of it in more detail! The new customization mechanics aren’t tied to Update 9.21. The Common Test marks the starting point in fine-tuning them, and its release timing depends directly on how well the test goes. We’ll release the new customization mechanics to production servers as soon as we’re sure that everything’s polished and works as it should. As always, we’ll keep you updated every step of the way. Right now, our top priority is smoothing out bugs and performance issues. We want to focus on meeting a high bar of quality, and believe your input will be instrumental in this. Style Sets. Customization items are now brought together in style sets designed to help you quickly personalize your vehicle. Preconfigured style sets might include a mix of paint, camo, emblems, etc., and automatically apply them in one click. The prices aren't final. Check the game client for the full list of relevant prices when the feature releases. Go for an authentic set or create your own styles. Plus, there's a rental style set available with Credits and useable for a number of battles. Paint. 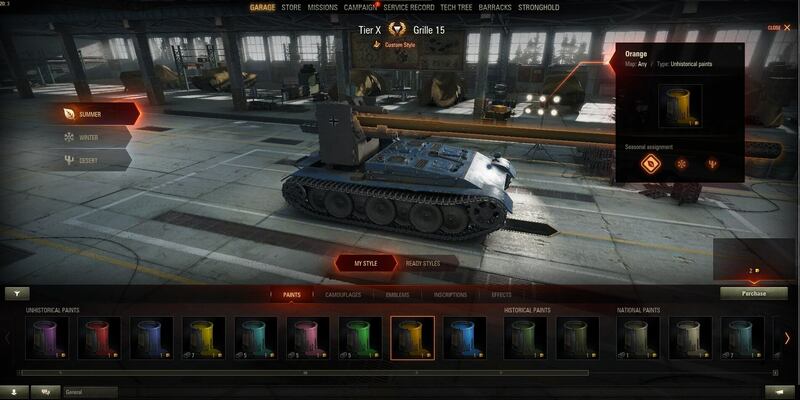 Each Tech Tree now has a variety of paints to choose from. They differ across nations and can be applied separately to the hull, turret, gun, suspension, and gun mantlet. Also, you can choose the main colour theme for winter, summer, and desert maps. Coloring each module takes one can of paint; painting the entire tank takes five. Make sure you’ve got enough in stock before you get started. Historically accurate and non-historical paint work differently. Having bought a can of non-historical paint, you can apply it for any season (one can per module). Historical paint is a whole other thing. With it, you need to buy paint separately for each season. In other words, you need 15 cans of historically accurate paint to fully color a tank for three seasons. Historically accurate elements are visible to all players by default. If you’d like to see all elements, including designs that diverge from history, just un-check the “Hide non-historic elements” box in the settings (“General” tab). It’s checked by default. Camouflage. Camo is now divided into three skins. 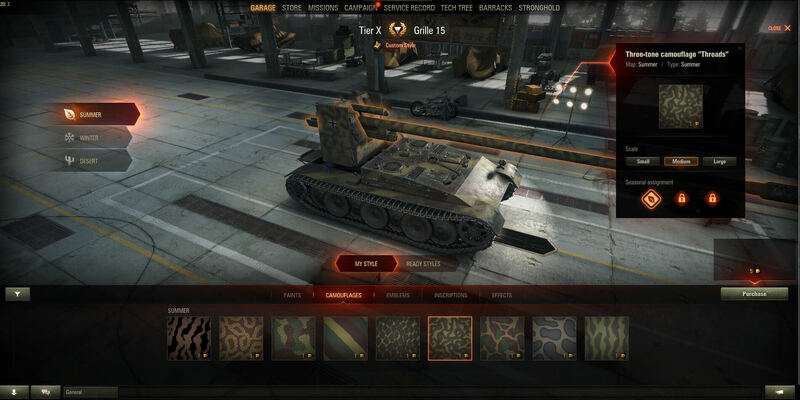 You can apply it separately to a vehicle’s hull, turret, and gun; put together a set from several camos for each season, and adjust camo sizes choosing from small, normal, and large—all of these for each area. For select camos, you can also tweak their looks, working within the set colour pallet. Don't worry, vehicles can still be fully covered with the camo you already have. The new customization system just splits them into three parts. Camo value bonuses are active when applied to the hull, and will decrease the enemy’s view range around your tank. Emblems and Inscriptions. Now, you can view where an emblem or inscription will be before application. The revamped UI shows designated areas for these items. All permanent camo, emblems, and inscriptions you purchased before the new mechanics release will be in your Storage when it drops. You spent money on them and they’re rightfully yours. Temporary camouflages will be withdrawn, but you'll have their costs reimbursed. Effects. You can give your vehicle a distinct look with aging and fading effects for paint and camo, going from sleek to aged or ancient. 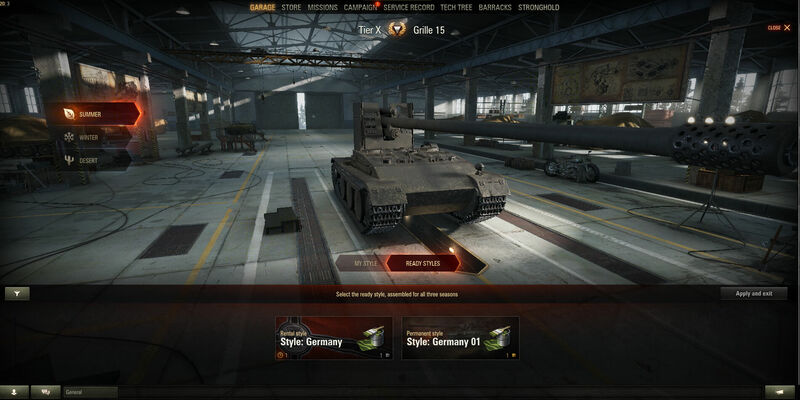 Currently, new effects, paints, and purchasable styles are available only for Tiers VIII Premium vehicles and Tier X tanks. We’re working on bringing them to lower tiers. Camos, emblems, inscriptions, and rental styles can be applied to all tanks. Fundamental changes to the customization system won’t work without a pricing revision. Right now, we're designing a uniform pricing model that will mesh with the new mechanics. The last thing we need is a rushed solution. So, we’ll take the time we need to do it right, and will offer you a full lowdown on the changes and the rationale behind them when we’re finished. To minimize any inconvenience the revision might bring, we’ll be giving everyone an exclusive nine-item set of camouflages when the feature releases. It consists of three season sets with skins for the hull, turret, and gun in each. “What’s so exclusive about it,” you ask? Well, unlike other, nation-specific camos, these special textures can be applied to absolutely any tank. Stay tuned for more details on new customization features!